For kids, their room is an expression of their interests and personality. For parents, it’s often a place that’s a struggle to keep neat and clutter-free! 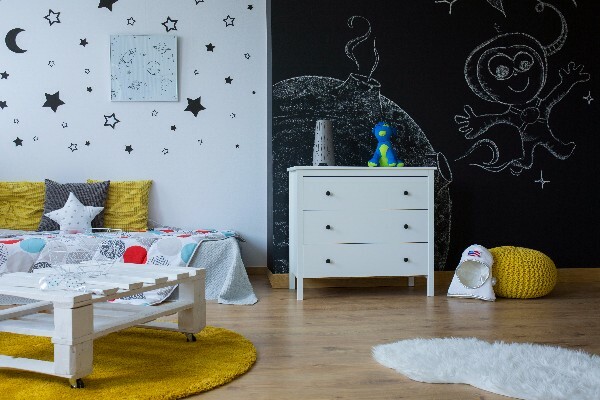 Here are kids’ bedroom decorating tips for creating a fun, yet functional, space. Floor space in a kids’ room is usually at a premium, especially if it’s shared. Thankfully, there are many kids’ furniture options to help you make the most of every square inch. When choosing a bed, look for storage features like bookcase headboards and integrated underbed drawers. If you sometimes need extra sleep space, many kids’ beds are available with a large underbed drawer that doubles for storage or a trundle. For shared rooms, bunk and loft beds are the ultimate space-savers. There are even corner models that can sleep three or four! The open space beneath a loft can be used to house a desk, dresser, or left open for more play space. Let your child’s personality shine through by incorporating his or her own handiwork into the decor. Create a gallery wall by framing your child’s favorite masterpieces and photos, or use inexpensive acrylic frames to easily switch them in and out. For a colorful, ever-changing room border, you can clip photos and drawings to a wire or sturdy string hung along the wall. Peel-and-stick cork board is easy to use, inexpensive, and can be cut into fun shapes. Mount it on the wall for plenty of pin-up space for pictures (and reminder notes from mom and dad!) Chalkboard paint turns a plain section of wall into an interactive surface for doodles, games and notes. Many kids go through phases—for months a particular movie or cartoon character is all they can talk about, then suddenly it’s dinosaurs or horses! Removable wall decals are an inexpensive way to incorporate your child’s (current) favorite thing into his or her room decor without committing to more permanent updates. Removable wall transfers are also an easy way to periodically change up colors and patterns, and update the room as kids age. Kids love to collect things: rocks, seashells, dolls, model cars, sports memorabilia, you name it. Only trouble is, these treasures can quickly turn into clutter if they’re not stored or displayed. Shadowboxes, box shelves and cube shelving units are perfect ways to display your child’s prized possessions. If the collection is one that they play with or like to riffle through, a storage unit with drawers or stackable totes is just the ticket. Kids’ tastes can change quickly, especially as they age. That hot pink decor your daughter begged for at age 10 might not be so welcome when she’s a teen. If you want to minimize the number of times you paint, go with neutral wall colors, or colors that can complement a range of bedding and accessory colors. Soothing blues, grays and greens have the added advantage of helping kids relax and wind down before bedtime. Follow us on Facebook for decorating ideas, decor trends, and the latest Wichita Furniture deals. Want help finding the perfect furniture and accessories for your kids’ room? Stop into our store or use our online chat feature—our friendly furniture experts are here to help.